Insect Morphology, Crop Pest and IPM, Nematology lab, Bio-control Lab, M. Sc. (Agri.) Research Lab, Insect raring room, Sericulture raring room. 3. TV talk and Radio talk. 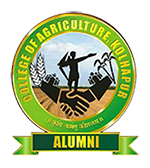 Department : Indian Council of Agricultural Research New Delhi sanctioned the Department of Entomology, College of Agriculture, Kolhapur as voluntary center, for All India Network Project on Soil Arthropod pests white grub and sanctioned Rs. 15.00 lakh for support the research on white grub. Dr. J. P. Sing, Founder Secretary FARMERS, NGOS visited to the department and undertaken demonstrations of utilization of Entomopathogenic nematode for management of White grub infesting sugarcane of Golthind Tal-Walva Dist – Sangli and Kunner, Tal-Kagal Dist – Kolhapur and Groundnut at Bhuaewadi Tal-Karveer Dist – Kolhapur. He has exposed satisfaction regarding the on going research for management of white grubs. Under DPC Scheme the Hon.The Collector of Kolhapur sanctioned Rs. 35.00 lakhs for supporting the research on the mass multiplication of Entomopathogenic nematode for the management of white grub infesting the sugarcane in Kolhapur district Presently, The mass multiplication of wax moth, Gallaria and rice moth is in progress.